Reggae Sumfest, dubbed the greatest Reggae Festival on earth, will be held at the Catherine Hall Entertainment Center in Montego Bay Jamaica in July 2013. It begins with a Beach Reggae Party at Aqua Sol Theme Park and then it continues at the Entertainment Center on July 21-27. A lot of visitors to the island go there to be entertained, but actually come here just for this amazing show. This year it features many Jamaican Reggae artists like Jah Cure, Elephant Man, I-Octane, Damian "Junior Gong " Marley, Taurus Riley, Beres Hammond, Lady Saw and many other great acts. Reggae Sumfest started in Montego Bay, Jamaica, after Reggae Sunsplash moved to Ocho Rios. Dance Hall night will be on the 25th of July. And it promises to be wonderful. Reggae Festivals are a huge foreign exchange earner for the island and the business people in Montego Bay did not want to lose out on the extra income that was generated from the festival. Before the Reggae Sunsplash started, some hotels would have close down during the summer months, but when the festival began they would be over booked and visitors would literally sleep on the nearby beaches in the days after they had danced all night! Foreign artist are also invited to perform at the festival every year too, so there is a wider variety and flavour of music. Music lovers will have all the great music they need in one place. Single, with partner or friend, the atmosphere is usually very fun and electrifying because the artists are often so full of energy. As the home of Reggae Music you will be entertained by new Reggae artists as well seasoned and vintage performers. And by the way, some artiste bring their dancers so you'll be able to see and learn some of the latest trends in Reggae dance moves. The food there is also usually very good, you'll be having tasty Jamaican food including Jerk and a whole lot more. 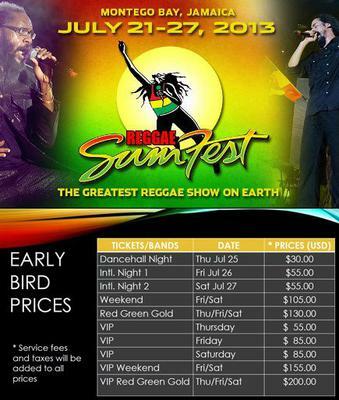 News in the street is that Reggae Sumfest 2013 promises to be the best one yet. See Also: Annual Events In Jamaica.